The Rural District contained Albury, Anstey, Ardeley, Aspenden, Braughing, Brent Pelham, Buckland, Buntingford, Cottered, Furneaux Pelham, High Wych, Hormead, Little Hadham, Meesden, Much Hadham, Stocking Pelham, Thorley, Westmill, and Wyddial. The descriptions of each place is given on the appropriate web page. Braughing is fairly centrally situated in the Rural District to which it gives its name. This is an extensive parish watered by the Quin which flows into the Rib near Ford Bridge. 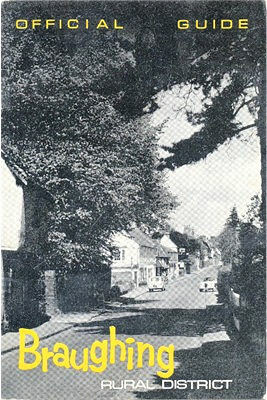 Hamlets include Hay Street, Cockhampstead, Bozen Green and Braughing Friars. Notable houses here are Upp Hall, a mellowed 17th century residence, and Hamels, set in a fine park. Roman remains including coins and a sarcophagus have been discovered in this parish. Braughing, recorded as Brachings in the Domesday Survey made by the Normans in 1086, may have been a Roman station. A weekly market granted during the reign of Stephen, and an annual fair have now lapsed. The village is picturesquely set above the river. The church, standing high, was largely rebuilt in the 15th century and has since been restored. The two-storey porch should be noticed; also the excellent modern carving of the chancel screen. The font of Caen stone is new; but the original font, 600 years old has been found and brought back into the church.